The Oklahoma Sooners turned heads against Ole Miss on Friday, racking up an NCAA Tournament-high 95 points in a 23-point victory. Scoring is expected to be considerably tougher on Sunday, when the 9-seed Sooners take on the top-seed Virginia Cavaliers at 7:45 p.m. ET in Columbia. 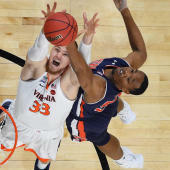 Virginia (30-3) has allowed fewer points than any team in the country, though it needed to rally from a halftime deficit to upend Gardner-Webb 71-56 on Friday, while Oklahoma (20-13) scored its season-high in its tournament opener. The latest Virginia vs. Oklahoma odds have the Cavaliers favored by 10.5, while the over-under, or total points Vegas thinks will be scored, is 126.5. It's the best defense in the nation against the hottest offense in the 2019 NCAA bracket, so before locking in any Virginia vs. Oklahoma picks of your own, you'll want to see what legendary Vegas bookmaker Micah Roberts is saying about the matchup. Roberts enters the second round of the NCAA Tournament 2019 on a strong 16-8 run on his college basketball picks against the spread. He's also nailed seven of his last 10 involving Virginia and three straight involving Oklahoma, giving him a blistering 10-3 run picking these squads. Part of his success: Roberts has worked in the Las Vegas sportsbook industry for over 18 years, including a 13-year run as Station Casinos' book director. He can spot a bad line from a mile away. Now, he has analyzed Virginia vs. Oklahoma from every possible angle and locked in his pick. He's sharing it only over at SportsLine. Roberts knows that Virginia trailed by as many as 14 to Gardner-Webb before the defense held the Bulldogs to 26 points over the final 33-plus minutes. Virginia has the nation's best defense at 55.1 points per game and is well-suited to shut down any attack. Oklahoma may have put up 95 on Ole Miss, but the Sooners are 0-5 against top 10-ranked defenses, losing by an average of 13.4 to Wisconsin, Texas Tech and Kansas State. Offensively, Virginia received 23 points from sophomore De'Andre Hunter and 17 with nine rebounds from Mamadi Diakite. The Cavs shot 52 percent even though Kyle Guy, who along with Hunter averages a team-best 15.4 points, managed just eight points. It was just the second time since December he'd been held to single-digits. Virginia averages 70.4 points, while Oklahoma has allowed 73 per outing over the last six games. But just because the Cavaliers are the top seed with the nation's best defense doesn't mean they'll cover the Virginia vs. Oklahoma spread. Virginia poses a strong defensive test, but Oklahoma's offense was a force on Friday. Four players scored at least 18 points, and star junior Kristian Doolittle had a double-double with 19 points, 15 rebounds and five assists. Virginia hasn't covered the spread in five-straight NCAA Tournament games. Oklahoma, meanwhile, is on a 14-3 against-the-spread run against non-Big 12 teams. The last time the Cavaliers made it to the second round of the Big Dance, they lost to Florida, 65-39, as the higher seed. We can tell you Roberts is leaning under, but he has also identified the critical x-factor that makes one side of the spread a must-back. He's only sharing what it is, and who to back, at SportsLine. Who wins Oklahoma vs. Virginia on Sunday? And what critical x-factor makes one side of the spread hit hard? Visit SportsLine now to find out which side of Oklahoma vs. Virginia you should back, all from a Vegas legend on a 10-3 run picking these teams.